Eduardo Rodriguez is 4-3 in eight starts for Pawtucket this season. FREDERICK, Md. 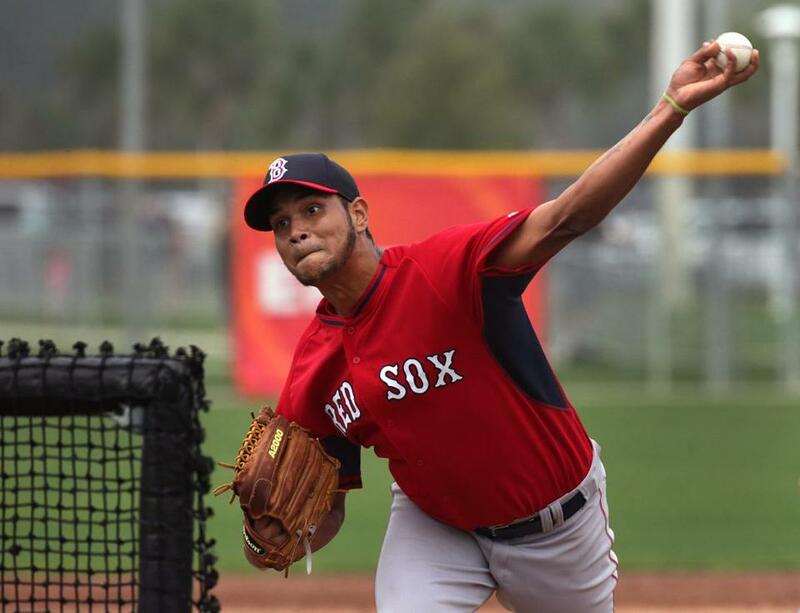 – Eduardo Rodriguez has experienced the sort of fast track rarely seen by Red Sox pitchers. When he takes the mound Thursday, at 22 years and 51 days, he’ll become the youngest Red Sox starter to make his debut since Michael Bowden in 2008 just days before his 22nd birthday. He’ll be the youngest lefthanded Red Sox starter to make his debut since Abe Alvarez in 2003. Members of the Orioles organization with whom he came up are unsurprised at how quickly Rodriguez’s opportunity has arrived. Indeed, they nod knowingly, mindful of their efforts to groom him for what they expected to be a rapid ascent to the big leagues. The Orioles tried to lay a foundation for him to get there as quickly as possible. In 2012, Rodriguez emerged as a prospect of distinction in Baltimore’s Single A Delmarva affiliate. At 19 and pitching mostly against older opponents, he went 5-7 with a 3.70 ERA, 6.1 strikeouts, and 2.5 walks per nine innings. Promising lefthander Eduardo Rodriguez makes his season debut when he takes the hill for the Red Sox tonight. In Delmarva, Rodriguez did little more than flash the potential for an above-average slider or changeup. But the ease with which he delivered a low-90s fastball that he could bump up at the time to 93 or 94 suggested a special arm. Yet there was something beyond a raw pitcher with an easy fastball. The O’s also saw something when he faced adversity. Evaluators who saw Rodriguez this year in Pawtucket raved about his makeup, the demeanor that one scout called that of a pitching assassin. “When runners got on base and they were in scoring position, you saw a guy who shifted gears and made better pitches. There was a focus and concentration that wasn’t there prior to that. You knew that as he matured and figured it out, he was going to be like that all the time instead of just in those situations. He handled pressure very well as a young pitcher,” Graham said. Baltimore also understood that Rodriguez was young, that he needed the right sort of guidance to take the accelerated path to the big leagues that his arm might permit. According to one O’s team official, Rodriguez had shown small signs of immaturity that weren’t entirely surprising given his age. There were times when he’d miss buses to the gym for scheduled workouts, and didn’t understand the routine necessary to get ready for his turn on the mound. So, prior to the 2013 season, just shy of his 20th birthday, the Orioles elected to give Rodriguez an extraordinary experience. They made him a non-roster invitee to big league camp as a 19-year-old who had never pitched a game above Single A. The decision was made partly in deference to Rodriguez’s talent, and to show what might be possible if he embraced the right sort of program between starts. Beyond dangling that carrot, the Orioles wanted to show Rodriguez the nuts and bolts of what big league pitchers did to prepare themselves. “I remember [Orioles manager Buck Showalter] put his locker in between [Pedro] Strop and Miguel Gonzalez,” said Graham. “It was a learning process, teaching him how to be a professional, how to go about his work, to help him with the culture at that level. It was strictly 100 percent a development process to bring him to big league camp and teach him how to be a professional – everything from the way to dress, the way to handle himself, the way to go through drills, execute his bullpens, do his weight program. It was a really solid reason for doing that. Steenstra remembered that, when the O’s reassigned Rodriguez to minor league camp that year, Showalter sat him down and let the lefthander know the high regard in which the Orioles held him as well as the organization’s expectations. When Rodriguez opened the 2013 season pitching for Steenstra in High A Frederick, they saw a pitcher with a greater understanding of what it would take to maximize his gifts. Instead, Steenstra and Rodriguez could focus on his development on the mound. The fastball remained a standout offering, but he needed to round out his mix. They focused on what was then Rodriguez’s third-best pitch: His changeup, the pitch that is now the lefthander’s best secondary offering. He also made strides in his ability to work to both sides of the plate. While he’d always been comfortable working to his arm side, pitching away from righthanders, in Frederick, he laid the groundwork for attacking righties on the inner part of the plate. Rodriguez went 6-4 with a 2.85 ERA in Frederick, pitching well enough to earn a midyear promotion to Double A Bowie, where as a 20-year-old he struck out a batter an inning and turned heads of numerous evaluators, including several with the Red Sox. Now, the Orioles will watch with considerable interest as Rodriguez makes his debut on Thursday for a competitor. The O’s – who had resisted dealing the lefthander despite repeated inquiries from others (for instance, Baltimore refused to include him in the deal that sent Bud Norris from the Astros to the O’s in 2013) – dealt Rodriguez to the Sox for lefthanded reliever Andrew Miller at the trade deadline in 2014. The Sox, meanwhile, hope that in the mess of 2014 they might have landed a future cornerstone.